The consultants had a point. M&A history is littered with equal partnerships that came unstuck because of clashing personalities and a lack of clear leadership. You don’t need to be a McKinsey partner to know that when you have “too many cooks” you might burn down the kitchen. It’s a pity, then, that France’s Essilor and Italy’s Luxottica didn’t think about that before agreeing a $53 billion eyewear merger in 2017. In a delicious irony, McKinsey is advising the joint company, EssilorLuxottica SA, on its post-merger integration. To say it’s not going well doesn’t do justice to this bruising piece of corporate theater. A very public falling out between billionaire Luxottica founder Leonardo Del Vecchio and Essilor boss Hubert Sagnieres plumbed new depths of opprobrium on Wednesday, when Del Vecchio’s investment firm, Delfin, said it was seeking arbitration from the International Chamber of Commerce over alleged violations of the merger agreement. Del Vecchio and Sagnieres are respectively the chairman and vice chairman of the new company, which has a combined 16 billion euros ($18 billion) of sales and about 150,000 employees. Supposedly, both have “equal powers,” but the 83-year-old Del Vecchio’s 32 percent stake makes him by far the largest shareholder. The Luxottica sunglasses empire was his life’s work, so combining it with a French public company run by an Insead MBA graduate always looked awkward. Yet once Del Vecchio decided he didn’t want one of his children to succeed him, a merger became the best option to advance his legacy. The deal was troubling from an antitrust perspective, giving the company vast power over most stages of eyewear production, but that should have offered considerable advantages to the owners. Each side has now accused the other of trying to exert undue influence over the merged group. Because they haven’t been able to agree on a CEO, decision-making appears to be deadlocked, which is disastrous for investors and a huge distraction for staff. The shares have sunk about 22 percent since the transaction closed in October. EssilorLuxottica remains essentially a holding company with two separate operating business; there are two finance directors, for example. That offers some protection from the mudslinging among the higher-ups, but the point of the deal was that the merging parties would realize up to 600 million euros of yearly synergies. Those savings aren’t going to be delivered in a hurry, if at all. The question is how to escape this mess. The simplest route would be to find quickly an external CEO acceptable to both Del Vecchio and Essilor. While that should be straightforward, mistrust is running high, and Del Vecchio is a difficult paymaster. If the arbitration fails, Del Vecchio must make a choice. 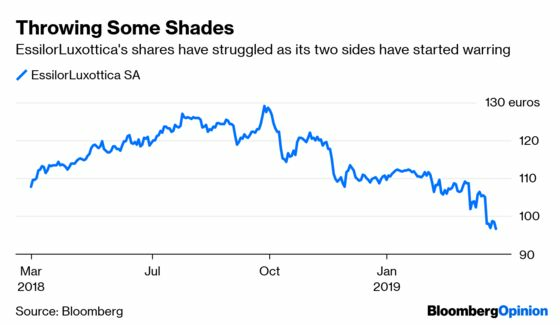 While unlikely, the 83-year-old could simply withdraw from the fray, as Volkswagen AG’s patriarch and chairman Ferdinand Piech did after falling out with his CEO in 2015. Alternatively, Del Vecchio might consider a full-blown coup. An agreement giving the two sides equal management weighting expires in the spring of 2021, so the gloves could come off after that. It’s a long time to wait, though, and analysts at Societe Generale think a takeover by the Italian might be possible. If a third party other than Delfin acquires 20 percent of the share capital or voting rights, according to SocGen, then Del Vecchio might be allowed to pounce under the terms of the merger agreement. If he can find someone willing to do that, then the path would be clear. It wouldn’t be cheap, of course. Even with the recent share price slide, the company has a market value of 42 billion euros. Acquiring the shares that Delfin doesn’t own would cost about 28 billion euros before any takeover premium. Even with Del Vecchio’s substantial net worth, this would probably need bank financing. And Del Vecchio’s not getting any younger. Any backers would have to weigh this up. In theory, a merger bringing together leading frame and lens manufacturers still has industrial logic, especially as big luxury houses try to seize control of their eyewear brands. That might concentrate minds on seeing a way out of this governance nightmare.